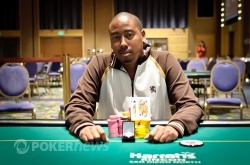 Congratulations to Seneca Easley, WSOP-C Rincon Main Event Champion ($70,384)! It's all over folks, the 2010-11 World Series of Poker Circuit Main Event at Harrah's Rincon has concluded and it's Seneca Easley walking away with the title, the gold ring and $70,384 in first-place prize money! Not only that, Easley has earned an entry into the $1,000,000 National Championship Freeroll to be held in Las Vegas at the end of May. The final table seemed to be cruising along at a nice, steady pace, but that pace came to an abrupt halt when Easley got heads up with Shaun Walker. The two players played extremely small pots, often limping in from the button preflop and checking the action down on the subsequent streets if not for one bet winning the pot prior. That, coupled with a few double ups from the short stack allowed for heads-up play to last a few hours. The biggest turning point came when Easley came from behind in a big all-in situation with pocket threes against Walker's sevens. Easley flopped a three on that hand to double up and take back the chip lead from Walker. On the final hand, Easley's was able to out-flip the for Walker, further proving the unluckiness of pocket sevens for Walker. A queen flopped and Easley held from there. Walker didn't leave empty handed though, he earned over $43,000 for his runner-up finish. That concludes our coverage of the Main Event here in Rincon, but we've got plenty more action still lined up starting tomorrow at 12:00 noon. The $10,000 Regional Championship will take place and run for the following four days. You can definitely expect some big names to be in that event and plenty of others who have been qualifying over the last week or so here in Rincon. Phil Hellmuth, Matt Waxman, Carter King, David Baker and Dwyte Pilgrim are just a few of the names who will be in the field so be sure to stay tuned to PokerNews for all of the action starting tomorrow! Shaun Walker squeezed his hole cards and considered his course of action for just a beat longer than usual. After a moment, he announced an all in for 670,000, and Seneca Easley asked for the count. When he learned the number, he made the call to put Walker at risk. It was another king-queen-versus-middle-pair flip, but the hands were reversed this time. The flop was just what Easley was looking for as his overcards found a pair to pull him into a big lead with two to come. The turn was no change for Walker, now drawing dead to the two remaining sevens in the deck. That's all she wrote for Walker, his sevens betraying him to leave him one spot shy of his goal. He'll have to settle for second place here today, bested by a formidable foe. Walker will take home more than $43,000 for his work over the past three days. Shuan Walker raised all in from the big blind for 585,000 after Seneca Easley made it 330,000 to go from the button. Easley called. The flop came down and Walker spiked a pair of queens to take the lead. The turn was the , pairing the board, and the river was the . Walker doubled and is now back to 1.18 million in chips. Seneca Easley and Shaun Walker saw the flop of for the minimum with Easley in position. Walker checked the flop and Easley bet 75,000. Walker made the call. The turn was the and Walker check-called again, this time for 125,000. The river was then placed on the board -- the . Walker checked and Easley moved all in, having Walker covered. Walker tanked with 465,000 behind and eventually folded after a couple of minutes of thought. From the button, Seneca Easley opened to 100,000, and Shaun Walker once again three-bet to 250,000 total. Easley wasted no time calling, and off they went to a flop. 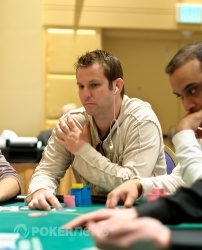 Walker continued out with 200,000 more chips, and Easley called even quicker this time. That brought them to the turn, and Walker took just a moment's pause. He tapped the felt, and Easley took his cue to announce an all in shove. Walker uncapped his cards with a bit of frustration crossing his face, surrendering them to the muck and dropping his stack down under 1 million. From the button, Seneca Easley raised to 100,000. Shaun Walker reraised to 300,000 from the big blind. Easley came back with an all-in shove for 1.24 million and Walker called after getting a count on the chips. The flop came down to Easley smacked a set of threes to take a big come-from-behind lead in the hand. The turn was the and the river the . Walker's sevens went down and he sent the chips over. We Have Another Three-Bet... And a Four-Bet! With the button in front of him, Seneca Easley opened to 100,000, the usual. What was unusual was Shaun Walker's response, a rare three-bet to 250,000 total. Easley didn't waste much time announcing a four-bet all in, and Walker leaned forward across the felt. "Did you say you're all in?" Easley nodded. 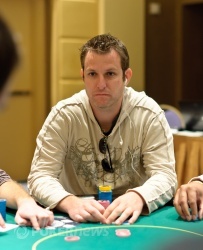 "Oh, I call," Walker said with confidence, committing his last 1.2 million chips to the pot. "Wow," Easley said as he shook his head. "Cold deck." Little did he know how cold the deck could get. He was looking for a ten, but Walker instead found two more aces as the flop came . Easley could only chuckle as his misfortune as the turn and river filled out the board for good measure. After that double, Walker is now in control with 2.61 million, dropping Easley down close to 1 million. Shaun Walker opened the button with a raise to 100,000. Seneca Easley reraised to 200,000 from the big blind and won the pot. This is the first three-bet we've seen during heads-up play. Easley has been chipping away in a number of small pots, and it looks like he's taken the chip lead in the duel.